Re-wire on a Hayes Roast! Hayes Roast is this season’s new addition to the offering at Hayes Engineering & Homestead, a Central Otago property cared for by the New Zealand Historic Places Trust (NZHPT). “It’s been inspired by the inventions and ingenuity visitors experience at the site,” says Property Manager Scott Elliffe. In partnership with Vivace Coffee, the NZHPT asked third generation artisan master roaster Bernard Smith to develop a blend of three original coffee beans that best emulated the strength of the site, the body of the ‘big skies’ Central Otago landscape and the sweetness of its sun overhead. The brand’s graphic is a testament to Hannah Hayes, Ernest’s wife, who pedalled hundreds of kilometres ‘peddling’ her husband’s ingenious devices to farmers in the region. “Fittingly, visitors to Hayes Engineering & Homestead are invited to ‘re-wire with a Hayes Roast’ from our café when arriving on-site. They can also take-away the convenient 250gm ‘pedal pack’ and ‘plunge a memory’ that evening as they reflect on this truly great pioneering story,” says Scott. Hayes Engineering & Homestead is one of nearly 50 properties managed by the New Zealand Historic Places Trust. 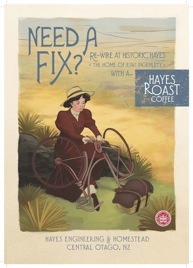 Kiwi ingenuity at its best is brought to life at Hayes, which began life as a small workshop for Ernest Hayes in 1895. By the 1930s it had grown into a business with a worldwide reputation, providing farmers with everything from wire strainers to windmills. Open 10am - 5pm daily, September – May. Closed June-August.